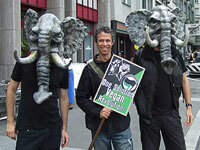 In Switzerland, the animal rights movement has slowed down a little in recent years. 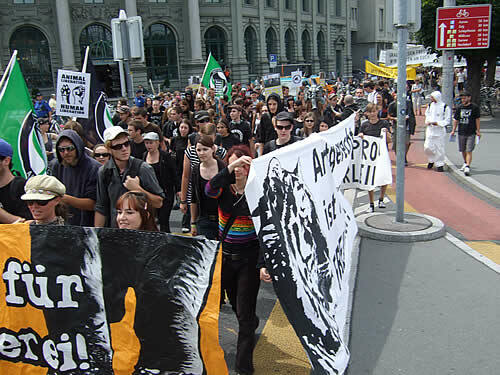 Switzerland has rather better animal welfare laws compared to international standards, and there are many activists, but it seems that there are not many people willing to organize demos or events, there are few active organisations and no nationwide focused campaigns. As a movement, Switzerland is looking over their eastern border towards Austria for inspiration. 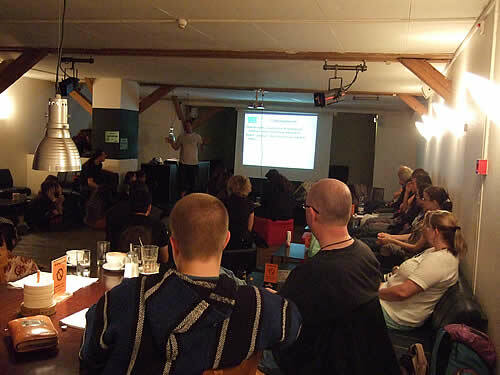 The Animal Liberation Workshop ALW was organized at the Café Parterre in Luzern, in the centre of Switzerland. The Café provided good vegan food for all. 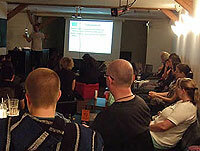 Although only activists from Switzerland and Austria participated, the workshop was held in English, since many of the Swiss activists had French or Italian as their native languages. 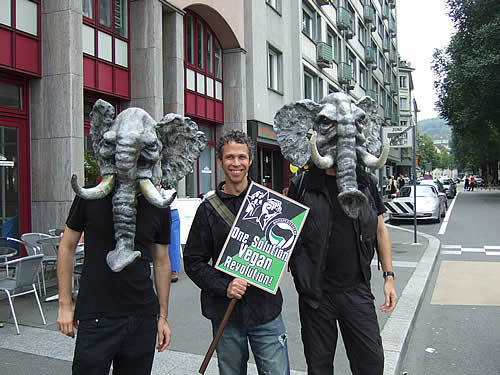 The plattform AZOT was founded recently in Switzerland, in order to start a nationwide campaign against the circus Knie, which is not just a very big circus with countless animals including 8 elephants. Circus Knie is also pampered by the press and seen as a national heritage by the public. But that was not too different with the circus Knie in Austria, run by a brother of its Swiss counterpart, against whom Austrian activists had instigated a hard hitting campaign from 1996-2002, ending with a ban on wild animals in circuses. AZOT, however, stress very much that they would not be content with a wild animal ban, but want all nonhuman animals banned from circuses full stop. Still, the Austrian campaign and its experiences is obviously of central interest to Swiss activists and made a good starting point for the workshop. 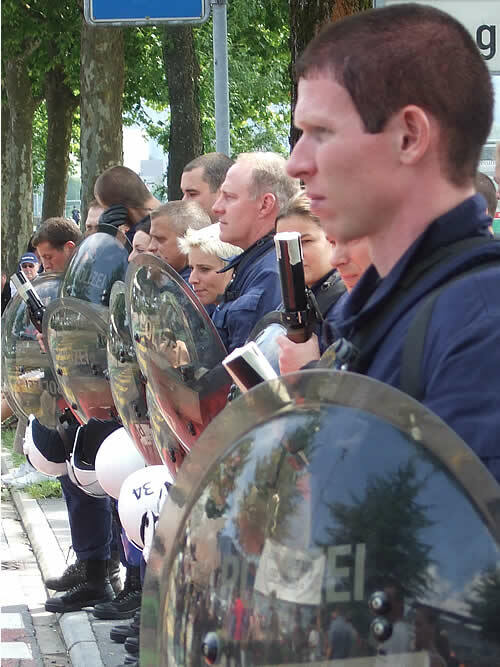 AZOT has so far organized 2 demos against the circus Knie. With almost 80 participants, this ALW was larger than all other international ALWs before. 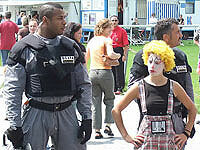 There was also a demo organized at this ALW, which took place on Saturday morning against the circus Knie. 300 people joined the demo march through town and out to the circus. The demo was very noisy and aggressive, supported by a van blasting out techno music. Ever so often, speeches were held against animal abuse and animal circuses in German, Italian and French. Actually, the circus wanted to parade through town with its elephants on this morning to promote its shows, but thought better of it and dropped the plans. 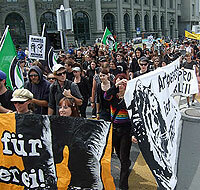 Activists had been prepared with a blockade and a banner drop, but after the circus had changed plans, the demo march took place nevertheless. Feeling threatened, the circus sent a man to spy on the animal liberation workshop, but he was discovered and sent away, not before he threatened with violence should a campaign against the circus go ahead. 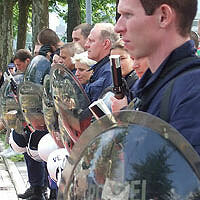 The peaceful demo march was disrupted by police madness. Near the circus, suddenly quite a few police officers in riot gear with rubber bullet guns and tear gas grenades turned up and started provoking activists and push them around. But the activists stayed calm, moved back a little and finished their protest in their own time. 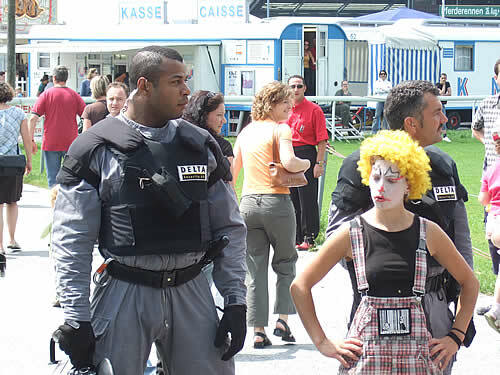 The so-called clown army of activists took over the dealings with police, but police reacted totally childishly and violent to the clown gimmicks, and were clearly out for a fight that morning. After the demo, the ALW continued. On Saturday, topics were animal rights philosophy, different forms of protest and actions, civil rights and campaign experiences. Participants from Switzerland reported on their activities and the citizens’ rights against police were outlined. 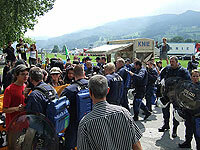 Police repression, however, is unbelievably harsh in Switzerland. An activist was held for 4 months on remand for putting up anti-vivisection graffiti, and frequently authorities ban leafleting on demos or showing placards that might deter people from shopping. To register a demo, Swiss activists have to pay some 100 Euro, which means only rich people can afford continued protests. 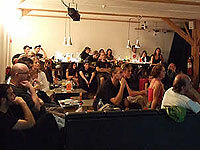 It seems that a concerted effort is necessary to establish a free space to protest in Switzerland. On Saturday evening, Keith Mann spoke on the history of the radical animal rights movement and presented his new book on this subject. Also, he showed the film “Behind the Mask”, which also features him, and which outlines the motivation behind radical activism for animal rights. Stipulated by Keith Mann, postcards were sent to all animal rights prisoners around the world. On Sunday, topics were campaign strategies, investigations, open liberations, founding animal rights groups and the Austrian trial for personhood of a chimp. After the ALW, some participants visited the newly formed local animal sanctuary and a centre for meditation and animal protection in the mountains nearby. The ALW in Switzerland was a very positive experience and might have provided just the spark that was needed to turn the highly charged Swiss movement into a big fire.